Want Pond Lights that Last Longer and are Safer for Fish? Welcome to PowerBee Underwater Pond Lights, Low Voltage Mains and Solar Lighting for Ponds, a Safer & Cheaper Way to Light Up Ponds. 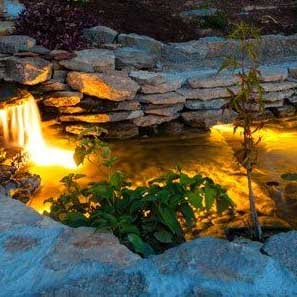 Add some Light to the Pond, and Enjoy the sight of a Glowing Paradise and Highlighted Pond Features, we sell both Solar Powered and Mains, our Prices are Unbeatable!. Mains Free Pond lights, No need for Electrical wiring work, Simply to install, Work for Hours and All night in Summer, just place your Pond Lights in Your Pond, and the Panel in a Good Location that gets Sunlight, and Enjoy Hours of mains free Solar Lighting. Our Mains Pond Lights are low voltage, produce a great light output, an electrician needs to be used to install mains. Our solar pond lights, also acts as a deterrent to would be fish burglars. The statistics prove that a burglar will always choose a property without lighting as opposed to one with.